Is your zippered mattress cover shot? Well we've got good news for you. We are now offering our top of the line bamboo/wool and organic cotton zippered covers as direct replacement for your existing mattress cover. Now that the legal stuff is out of the way let's talk more about the design and uses for our replacement mattress covers. Look, we know that stuff happens. Pets can urinate on your mattress, drinks and other liquids can spill, zippers can break and movers can damage your zippered mattress cover. We've found that most companies will charge very large fees for a factory replacement cover. We also know that the components we use in our mattress covers are often superior than the factory mattress covers and offer even a greater value. All covers are made on site here at our Phoenix, AZ mattress factory. 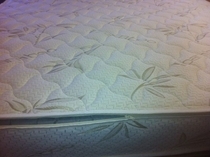 This cover comes with a stretch knit bamboo fabric quilted to over an inch of all natural New Zealand Joma Wool. Wool helps wick away moisture and is cool in the summer and warm in the winter. Works best on a latex mattress but also on memory foam, waterbeds and air beds. The zipper is the strongest in its class made with Teflon and zips around all four corners making it easy to assemble. These covers come in all conventional sizes and heights of 6", 8", 9", 10" and 12". Features are the same as above but with organic cotton fabric and quilted to pre-compressed natural wool for a thinner look and feel. Puts you closer to the latex or foam. Even the quilt backing is made with organic cotton making this the perfect choice for the most natural replacement mattress cover on the market.